Cytology (generally known as cell biology) is the topic of this part of the Atlas, which is mainly focused on the organization of the cell. But, what is a cell? The following may be a good definition: cells are the anatomical and functional units of living organisms. Cells may be alone or grouped to form multicellular organisms. A cell is the simplest molecular organization regarded as alive. Three cell lineages are known to be present on Earth: archaea and bacteria, which are unicellular prokaryotes, and eukaryotes, which can be unicellular or form multicellular organisms. Prokaryotes (previous to the presence of a nucleus) do not usually have internal compartments surrounded by membranes, while eukaryotes (with true nucleus) always contain internal membranous organelles. 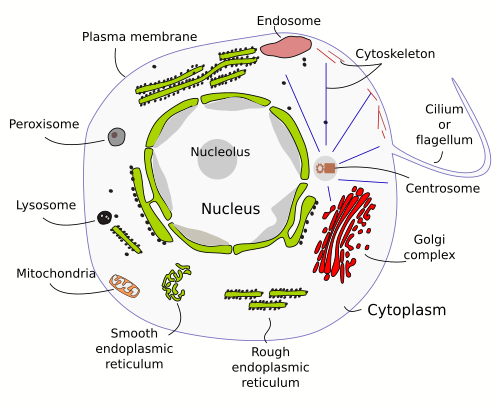 The nucleus is a characteristic compartment of eukaryotes. Cells, either prokaryote or eukaryote, are highly organized sets of molecules. In fact, cells have many internal compartments with specific functions. Let's say a cellular compartment is a space, delimited or not by membrane, where a necessary or important function for the cell is performed. One of the compartments found in every cell is the cell membrane, also known as plasmalemma or plasma membrane, which encloses all the other cellular compartments. Plasma membranes is a semipermeable barrier separating the inner cell space from the outer cell space. Eukaryotic cells have internal compartments delimited by membranes. The nucleus is one of them. It is bounded by a double membrane and contains the genetic material known as DNA. DNA stores the information that cell needs to carry out tasks for surviving and reproduction. The space between the nucleus and the plasma membrane is filled with the cytosol, an aqueous gel containing a large variety of molecules involved in structural and metabolic functions, in homeostasis, in signaling, and many other requierements of the cell life. For example, the ribosomes are involved inf protein synthesis, the cytoskeleton is needed for the internal organization of the cell and mobility, many enzymes and co-factors are in charge of the metabolism. Between the cell membrane and the nucleus, surrounded by the cytosol, there are many organelles, membrane-bounded compartments, that accomplish functions such as digestion, respiration, photosynthesis, metabolism, intracellular transport, secretion, energy production, storage, etcetera. 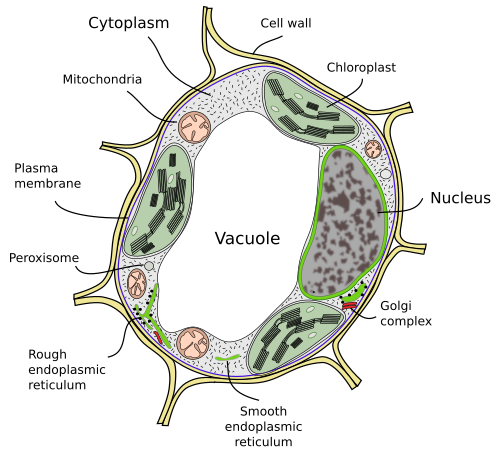 Mitochondria, chloroplasts, peroxisomes, lysosomes, endoplasmic reticulum, and vacuoles are some of these organelles. The cytoplasm is the cytosol plus all the organelles, excluding the nucleus. See figures 1 y 2. Figure 1. Main compartments of an animal cell. Figure 2. Main compartments of a plant cell. Compared to eukaryote cells, prokaryote cells (bacteria and archaea) are usually described as lacking organelles. If organelles are defined as membrane-bound compartments, it is true that most prokaryote cells lack organelles. However, there are internal membrane-bound compartments in some prokaryote cells. Membranes of these compartments are usually continuous with the plasma membrane, i.e. they are actually inward folds (invaginations) of the plasma membrane or are formed by detaching these invaginations from the plasma membrane. Four types of internal prokaryote membrane-bound compartments have been described: thylakoids, chlorosomes, magnetosomes and carboxysomes. In the following pages we will take a tour through the different parts of the eukaryotic cell and its surroundings. Some aspects of the cell function will not be deeply addressed here, such as gene expression or cellular metabolism. It would need a huge amount of space which would undermine the idea we want to give about the cell. Furthermore, there are many Internet sites dedicated to those subjects. The different "places" of the cell that we are going to "visit" are shown at the right side panel.